Murshid Samuel L. Lewis, aka Murshid S.A.M. (Sufi Ahmed Murad), dubbed ‘Sufi Sam’ by newpaper columnists in San Francisco in the 1960’s, was a forerunner of universal religion and unitive mystical experience in our time. Along with his mentors Hazrat Pir-o-Murshid Inayat Khan, Swami Papa Ramdas, Mataji Krishnabai, Sensei Nyogen Senzaki, and other illuminated souls, he sought to answer the cry of humanity by the sharing of spiritual teachings and practices, as well as by his own awakened presence. As a soil scientist and horticulturist concerned with feeding the world’s hungry, he endeavored to improve the quality and quantity of food production planet-wide by promoting organic gardening, seed exchange, sea water desalinization and desert reclamation. 1915: His interest in Eastern Philosophy and World Religions blooms when he visits the booth of the Theosophical Society at the San Francisco World’s Fair. 1916: He studies non-Euclidean geometry and mathematical philosophy with Professor Cassius Keyser of Columbia University, who later introduces him to Dr. Alfred Korzybski and thus to General Semantics. 1919: At 23 years of age, he returns to California to live and work with a community of Sufis in Fairfax. They have come together to study and practice the teachings of Hazrat Inayat Khan, the Sufi teacher and musician from India. Samuel will embrace and develop these teachings throughout his whole life. 1920: He begins Zen study with Sogaku Shaku, a disciple of the Rinzai Zen Buddhist Abbot Shaku Soyen. When Sogaku Shaku is assigned to teach in Hawai’i, Samuel continues his study with the Zen monk Nyogen Senzaki. 1923: At the age of 27, he receives spiritual initiation from Hazrat Inayat Khan, the first person to deeply touch and awaken his heart. 1925: During a spiritual retreat in Fairfax, Samuel receives inner initiation from Khwaja Khidr, often identified with Elijah and known to Sufis as “the Green Man of the Desert.” This initiation leads to appearances by all the prophets in turn, culminating with Mohammed. 1926: As a result of the preceding experience, Pir-o-Murshid Inayat Khan conducts a series of six interviews with Samuel at the Beverly Hills Hotel in Hollywood. He is appointed “Protector of the Message” by Hazrat Inayat Khan who dies the following year. Nyogen Senzaki, aided by Samuel, opens the first official Zendo in America in San Francisco. Samuel introduces fellow Sufi student Paul Reps to Nyogen Senzaki, and the book Zen Flesh, Zen Bones results from their collaboration. 1930: He travels to New York and receives Dharma Transmission from the Zen teacher Sokei-An Sasaki. The vision of the world’s future is opened to him, including the rise and fall of Germany and Japan. These visions are recorded in his Book of Cosmic Prophecy. 1937: Samuel studies the Yoga of Ramana Maharshi with Paul Brunton. 1945: He is awarded a Certificate of Service by Army Intelligence (G2) for top secret clairvoyant work. During the War, he “saw” Rommel’s troop movements in North Africa, and submitted reports to G2. 1946: In the inner world, Hazrat Inayat Khan turns Samuel over to Mohammed and Jesus for guidance. He begins world food and peace concentrations. 1956: Samuel carries out a seed exchange program during his first voyage abroad. In Japan, he enters Samadhi in the presence of Roshi Sogen Asahina, and is appointed “Fudo, Protector of the Dharma.” In India, he receives initiation from Swami Papa Ramdas who gives him the mantra Om Sri Ram Jai Ram Jai Jai Ram. This mantra will later inspire many of the Dances of Universal Peace. In India and Pakistan, he is initiated into various Sufi orders, including Chisti and Nakshibandi. 1960: During his second trip abroad, he is initiated into the Rifai and Shadhili orders in Egypt. In Pakistan, he is publicly recognized as a Murshid by Pir Barkat Ali of the combined Chisti-Kadri-Sabri orders. Pir Dewwal Shereef of the University of Islamabad appoints Samuel as his American representative. 1961: He meets with India’s President Radhakrishnan. He studies with Swami Ranganathananda of the Ramakrishna Order. He visits Papa Ramdas and Mataji Krishnabai at Anandashram in South India. 1962: He returns to the United States. At this point in his life, he considers his work in America to be like that of Moineddin Chisti who brought Sufism to India many centuries earlier. 1966: Samuel is ordained “Zen-shi” by Korean Grand Master Kyung Bo Seo. 1968: He meets Pir Vilayat Khan, a son and successor of Samuel’s first Sufi teacher Hazrat Inayat Khan. Their meeting is of signal importance, for it leads to the revitalization and spread of Sufism in the West, which had been divided and ailing since Hazrat Inayat Khan’s death in 1927. 1969: Samuel travels to New Mexico and stays at Lama Foundation for a week, teaching spiritual dances, giving darshan, watering the garden, etc. He visits several other intentional communities between Questa and Santa Fe. It seems that this journey marks a major turning point in his life and work. After many years of rejection by the academic community, he is paid to travel in the fully-accepted role of teacher and guru. He teaches various communes and family groups how to dance together. When he returns to Lama one year later, the dancing has spread through the Taos Valley north into Colorado and south to Albuquerque. At Lama Foundation he finds a place where his own teachings are being practiced. Lama’s view that spirituality is made real by practical application, is his own message. Samuel and Lama find friendship and common ground in their universal and eclectic approach to spiritual practice and realization. On December 28th, shortly before sunrise, Samuel slips and falls down the front stairs of his home, suffering a severe concussion. He is taken to the hospital in a state of shock. For two and a half weeks he is in and out of coma, sometimes unconscious, sometimes delirious and incoherent, and sometimes perfectly clear and rational. On January 15th, at the age of 75, Samuel dies at Chinese Hospital in San Francisco. His body is taken to Lama Foundation, north of Taos Pueblo, and buried in a sacred ceremony. His gravesite is known as the Maqbara. The Maqbara of Murshid Samuel Lewis, like the shrines and dargahs of Sufi teachers in the East, is a place of baraka, of blessing, of peace. Nestled on Lama Mountain, it is a place of pilgrimage where we can reconnect with spiritual reality, recharge our batteries, seek an answer to life’s problems. Upon seeing Sunseed at the writer’s guild theatre one Saturday morning in 1973, I saw Murshid Samuel Lewis and cried tears of joy. I had seen a real human being! for the first time. I went to the Mendocino camp and one morning was blessed with a vision of him in the morning dance circle with Moiinudin Jablonsky. 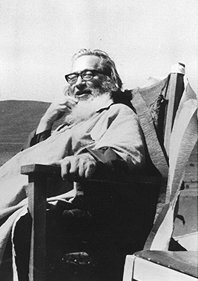 Later at a camp in 1975 at Lama I made a pilgrimage to his Makbara, and upon approaching it, I heard distinctly behind my head:”AKlak Allah,” and again “Aklak Allah.” I circumambulated the makbara and went down the hill where I came across Iqbal Lews and told him what I had heard, but did not know what it meant. He directed me to the library and I opened his comentary on the gathas to the page which illuminated the practice of the presence of God. I have practiced this from time to time. On MURSHID SAM BE BLESSINGS! This was early in my experience of the Dances of Universal Peace. I decided to go to Lama to a dance camp. Then I did not know very much, only that I was inspired by the dances and curious about the experiences I had while dancing. I packed my large tent, my two children, then probably 4ish or and 9ish, (they are now 19 and 23) got on a plane , took a drive, and eventually, there we were on this mountain. I had no experience with intentional spiritual communities or with a dance camp of this nature. But it was great and all went well that whole week. I participated in as many scheduled events as I could. The kids were off on their day and were having a good time. I decided to experience “darshan” one afternoon and scheduled a darshan time. I had no idea what that was. So there I go up this path to this little building. Inside I go and there is Wali Ali. It is quiet and still. I sit across from Wali Ali who is seated. We don’t talk. He just looks at me and after a few seconds says, “Joy!” He said a very short statement and I think it was that my essence was about expressing joy. I walked out of the little building and up another path and came upon Murshid Sam’s gravesite. The pile of rocks was amazing and beautiful. I had never seen something quite that wonderful as a resting place for someone. I came to kneel at the foot of this beautiful resting place. I was feeling all this gratitude for Murshid Sam. My heart felt happy. I had a small heartrock in my pocket and felt compelled to lay in on the stones. As I laid the heartrock in place, I felt the distinct unmistakeable weight of a hand on my shoulder. It was steady, calm and strong. I had an immediate knowing it was Murshid Sam. I have felt so blessed by Murshid Sam. I can’t explain it with any logic, so forget that, if you expect me to. Every now and again, I feel Murshid Sam’s presence. I don’t get why it happens, but only at times it does. I am truly grateful. I thank you for this opportunity to share my story of Sam in this venue. And to all his beautiful mureeds, thank you for all you do.